Polo is a dynamic and exciting team game that is played on horseback. One of the oldest known sports in the world, it is thought to have originated in Persia over 2000 years ago. The game as we know it today originates in India in the 1800s, where British soldiers who were stationed there saw the game being played locally and adapted it for their own uses, often using it as training for cavalry riders. Brought to Britain soon after, rules were established and from then on the game spread, and is now played across the world where as well as the UK, it is particularly popular in Argentina and the USA. The sport is overseen by the Federation of International Polo. The object of Polo is for a team to score more points than its opposition, thus winning the game. Each team attempts to move the ball into the opposition's half of the pitch with the aim of eventually hitting it through the goal to score. 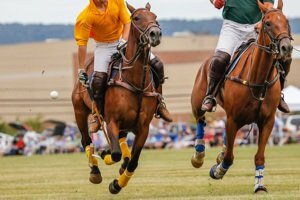 Each team of four is made up of attackers and defenders, but realistically all members of a polo team are expected to be flexible and make any play whether offensive or defensive and change position as necessary to benefit the team. Each team is made up of four players, each one assigned a position which is displayed by the number worn on their kit. Position 1 is known as an attacking offensive player, similar to a striker in soccer or forward in hockey. Hard and accurate hitters of the ball, their prime aim is to score but when defending, they also have the responsibility of looking after the opposition’s position 3 player. Position 2 is an offensive player primarily, backing up the position 1 player in attack. However, they also have defensive responsibilities, often interchanging with the position 3 player when they attack. Position 3 is very similar to the quarterback position and is usually a position that is filled by the best player in the team. It is an attacking position and players in this position must be able to hit the ball accurately upfield to the position 1 and 2 players. Position 4 is a defensive position, tasked with defending the team’s goal. However, they do have offensive responsibilities and when successfully defending the goal, they are expected to move the ball forward accurately to the team’s offensive players. In terms of equipment, the most obvious piece of equipment is a horse specifically bred for the game of Polo, known as Polo pony. Each player will need at least two to switch out between chukkas and these may be the player's own or they may be provided by their club. These horses will need a special saddle which will enable the player to be seated securely, control the horse and swing the mallet. Other essential pieces of equipment are a helmet, a polo stick, knee guards and a ball. Scoring is simple in Polo, and a point (known as a goal) is scored when the ball is hit into the goal. Unlike many other games that change halves at set periods such as halftime, in Polo, teams change field direction every time a goal is scored. It’s not known exactly why this is the case but it is thought that it stems from the past where pitches were traditionally on an East/West axis and teams would not want to spend extended periods of time with the sun or wind in their face. The team who have scored the most amount of goals and thus end up with the highest amount of points at the end of the game are deemed the winners. If the game is drawn, another chukka is played and the first to score wins. If nobody scores in this, another chukka is played in which the goalposts are widened and the first to score wins. Polo is played on a Polo field that is 300 yards long and 200 yards wide, although this may be just 160 yards wide if it is a boarded pitch. The goalposts have a width of 8 yards and are open at the top. Each Polo match shall consist of 4 chukkas (plays), each one lasting 7 minutes of actual play. The game shall start when the umpire throws the ball in between the two teams. This is how play is restarted after a goal is scored too. When a goal is scored, the teams change ends, which helps to equalise any ground or weather advantages. Players may challenge opposition team members by ‘riding them off’, which is where a payer rides their pony alongside their opponent’s and attempts to move them away from the ball or even take them out of play. Player may also ‘bump’ the opposition, which is a physical manoeuvre akin to the body check in hockey. Players may also hook an opponent’s stick when they are attempting to hit the ball. Polo is overseen by two mounted umpires who consult each other on decisions. Should they disagree, they can seek the opinion of the match referee also known as the ‘third man’. Following a foul, a free hit may be awarded towards goal. The team with the most amount of goals at the end of the match is declared the winner.